Fire detector sensing elements are located in many high activity areas around aircraft engines. Their location, together with their small size, increases the chance of damage to the sensing elements during maintenance. An inspection and maintenance program for all types of continuous-loop systems should include the following visual checks. Note: These procedures are examples and should not be used to replace the applicable manufacturer’s instructions. Cracked or broken sections caused by crushing or squeezing between inspection plates, cowl panels, or engine components. Abrasion caused by rubbing of the element on cowling, accessories, or structural members. Pieces of safety wire, or other metal particles, that may short the spot-detector terminals. Condition of rubber grommets in mounting clamps that may be softened from exposure to oils or hardened from excessive heat. 6. Nuts at the end of the sensing elements should be inspected for tightness and safety wire. [Figure 2] Loose nuts should be retorqued to the value specified by the manufacturer’s instructions. Some types of sensing element connection joints require the use of copper crush gaskets. These should be replaced any time a connection is separated. 7. If shielded flexible leads are used, they should be inspected for fraying of the outer braid. The braided sheath is made up of many fine metal strands woven into a protective covering surrounding the inner insulated wire. Continuous bending of the cable or rough treatment can break these fine wires, especially those near the connectors. 8. Sensing element routing and clamping should be inspected carefully. 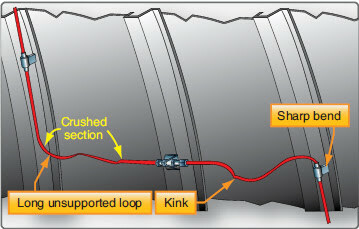 [Figure 3] Long, unsupported sections may permit excessive vibration that can cause breakage. 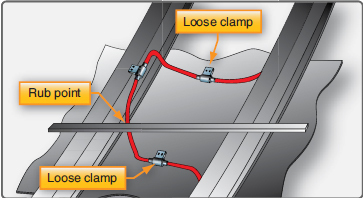 The distance between clamps on straight runs, usually about 8 to 10 inches, is specified by each manufacturer. 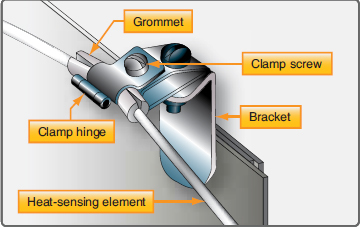 At end connectors, the first support clamp usually is located about 4 to 6 inches from the end connector fittings. In most cases, a straight run of one inch is maintained from all connectors before a bend is started, and an optimum bend radius of 3 inches is normally adhered to. 9. Interference between a cowl brace and a sensing element can cause rubbing. 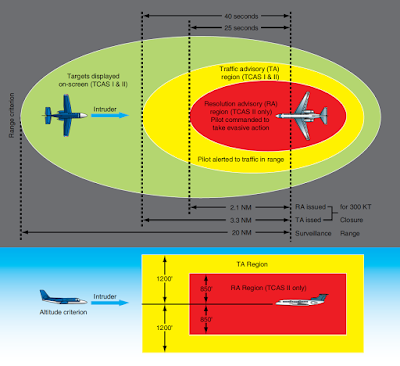 This interference may cause wear and short the sensing element. Intermittent alarms are most often caused by an intermittent short in the detector system wiring. Such shorts may be caused by a loose wire that occasionally touches a nearby terminal, a frayed wire brushing against a structure, or a sensing element rubbing against a structural member long enough to wear through the insulation. Intermittent faults often can be located by moving wires to recreate the short. Fire alarms and warning lights can occur when no engine fire or overheat condition exists. Such false alarms can be most easily located by disconnecting the engine sensing loop connections from the control unit. 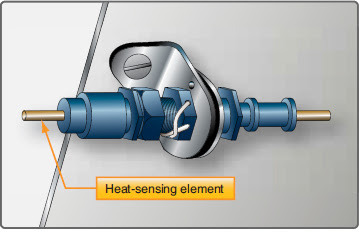 If the false alarm ceases when the engine sensing loop is disconnected, the fault is in the disconnected sensing loop, which should be examined for areas that have been bent into contact with hot parts of the engine. If no bent element can be found, the shorted section can be located by isolating the connecting elements consecutively around the entire loop. Kinks and sharp bends in the sensing element can cause an internal wire to short intermittently to the outer tubing. The fault can be located by checking the sensing element with an ohm meter while tapping the element in the suspected areas to produce the short. Moisture in the detection system seldom causes a false fire alarm. If, however, moisture does cause an alarm, the warning persists until the contamination is removed, or boils away, and the resistance of the loop returns to its normal value. Failure to obtain an alarm signal when the test switch is actuated may be caused by a defective test switch or control unit, the lack of electrical power, inoperative indicator light, or an opening in the sensing element or connecting wiring. When the test switch fails to provide an alarm, the continuity of a two-wire sensing loop can be determined by opening the loop and measuring the resistance. In a single-wire, continuous-loop system, the center conductor should be grounded.